Massive crowds expected as Jihad Mughniyeh will be buried in the same grave as his father. Analysts: Israel called Nasrallah's bluff. Lebanon's Hezbollah movement prepared Monday to bury the son of its slain former military commander after an Israeli strike that killed six of its terrorists. The raid, near Quneitra on the Syrian-controlled side of the Golan Heights, enraged the group's supporters, but analysts said Hezbollah would seek to avoid a major escalation with Israel. Once solely focused on fighting the Jewish state, Shiite Hezbollah, a proxy of Iran, is now deeply involved in the civil war in neighboring Syria, where it backs President Bashar al-Assad. With its forces spread thin, and little appetite in fragile Lebanon for a new conflict with Israel, analysts said Hezbollah would have to find a way to respond without provoking a full-on war. Hezbollah sources have been quoted as saying the same thing. 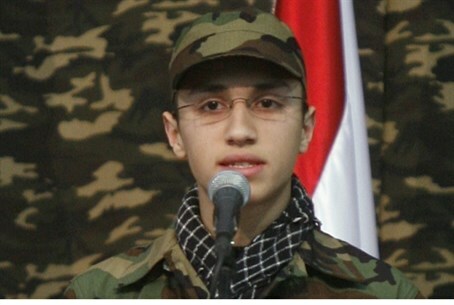 Hezbollah officials said Jihad Mughniyeh, son of the late Imad Mughniyeh, would be buried on Monday afternoon in Beirut's southern suburbs, a stronghold of the terror group. He is to be interred in the same grave as his father, who was killed in a 2008 car bombing that Hezbollah blamed on Israel. Massive crowds were expected for the funeral. The six men killed on Sunday afternoon were carrying out a field reconnaissance mission in Mazraat Amal village, Hezbollah's Al-Manar television said. An Israeli security source confirmed that an Israeli helicopter had carried out a strike against "terrorists" in the Golan who were allegedly carrying out an attack. In addition to Mughniyeh, the strike killed Mohammed Issa, a senior commander responsible for Hezbollah's operations in Syria and Iraq, a source within the Shiite movement told AFP. The raid raised tensions in Lebanon, with the army stepping up patrols along the so-called Blue Line, the UN-designated ceasefire line with Israel. There was no immediate comment from Hezbollah officials, but the movement's Al-Manar channel branded the strike "a costly adventure that threatens the security of the Middle East". The raid came days after Hezbollah chief Hassan Nasrallah threatened to retaliate against Israel for its repeated strikes on targets in Syria. Hezbollah says its intervention in the Syrian conflict helps the struggle against Israel because the Damascus regime forms part of a "resistance axis" alongside its main regional ally Tehran. "The repeated bombings that struck several targets in Syria are a major violation, and we consider that any strike against Syria is a strike against the whole of the resistance axis," Nasrallah said in an interview on Thursday. He boasted that Hezbollah was "stronger that we ever were as a resistance movement" and touted its sophisticated arsenal, including Fateh-110 missiles. The missiles have a range of 200 kilometres (125 miles) or more and are capable of hitting much of Israel. Analysts said the precision Israeli strike, just days after Nasrallah's bellicose remarks, stood to embarrass Hezbollah. "Hezbollah will not be able to retaliate, because if it retaliates, it will be another war. Hezbollah is in Syria and it is not ready for another war against Israel." Khashan said the movement could resort to small-scale attacks, like a roadside bomb on the ceasefire line with Israel it claimed last year, but would avoid a more serious response. "Nasrallah will say the Israelis are trying to provoke us to help in their elections and we will not fall into their trap. That's the best they can do," he added. In 2006, Israel fought a bloody war against Hezbollah that killed more than 1,200 people in Lebanon, and some 160 Israelis, mostly soldiers.